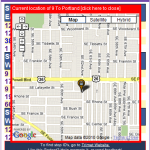 If you live in Portland, OR and ride public transit, you should check out this iGoogle Gadget that makes tracking buses easy. You can set up to 10 stops (perhaps near your home/work) and it will show all the latest arrivals in real-time. 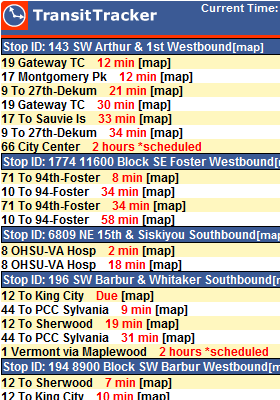 If you select on the [map] links next to each stop and bus you will get a popup google map that shows their location. It’s a great way to make sure you don’t wait in the rain, or miss your next bus. Go here to add it to your iGoogle page (if you don’t use iGoogle currently it’s easy to sign up). Once you have added the gadget to your homepage you will see instructions on how to add stops. 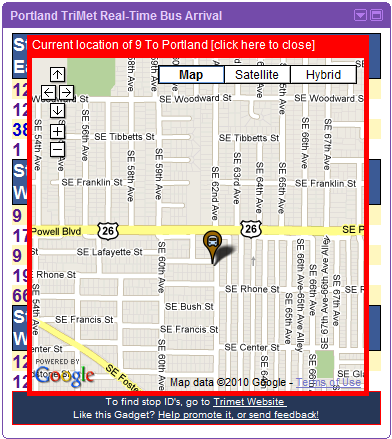 You can click on the link at the bottom of the gadget to search for stops (on the Trimet website). If you like the gadget you can use the link at the bottom of the gadget to give feedback or promote it (on Twitter, Facebook, your blog, etc…).